Test Flight of 1902 Wright Glider, Kitty Hawk, North Carolina. Since I was a boy, I have been drawn to biographies of historical figures because they are about real people who did extraordinary things. Recently, I made a startling discovery: Reading biographies about remarkable people isn’t just entertaining. In these books, I have found lessons that directly relate to my specific work as a design leader. One recent example is David McCullough’s book The Wright Brothers, a tale of the men who built the world’s first airplane. This true story about two inventive brothers from 115 years ago is surprisingly rich in lessons for today’s designers working on modern digital products. Creativity is an essential part of my job as a design leader. This applies not only to my day-to-day work in enterprise design, but also to the inspiration I can offer my team. What lessons can UX designers take away from the story of two brothers who, without college educations, in December 1903 rose from Dayton, Ohio, out of obscurity, to develop one of the most significant technological advances of the 20th century? Left: Wilbur (left) and Orville Wright sit on the porch of their home in Dayton, Ohio. Right: Orville (left) and Wilbur Wright on Flyer I in 1910. The Wright brothers were lifelong business and creative partners. They were inseparable since childhood, shared a joint bank account, and even had almost identical handwriting. Despite how close they were, they had distinct, unique personalities. Wilbur was the leader. He was better read and more inclined to engage in public speaking. Orville was younger and more skilled at the business side of their endeavors. He was more gregarious than Wilbur—but also more sensitive to criticism. Orville was often the conceptualizer, while the older Wilbur was more often the implementer. Their individual talents, abilities, and personality traits complemented one another. It’s vital for us as designers to seek and find creative partners whom we can trust to push us to constantly grow and improve with the goal of creating more productive and satisfying experiences for our users. As managers, it is essential that we bring together different people with varied personalities, disciplines, and perspectives to work together to solve our users’ problems. For some great insight into group problem solving, watch this “Design Is a Team Sport” talk by Jared Spool. In the case of the Wrights, neither man could have achieved alone what they accomplished together through their constant interaction. “I like scrapping with Orv,” Wilbur said. “He’s such a good scrapper.” Heated discussions were a common and vital aspect of the Wrights’ creative method. Their ability to passionately defend opposing positions while respecting each other’s point of view was crucial to their innovative achievements. As design team leaders, we should strive to create a culture that makes space for honest critique of one another’s ideas while embracing conflict respectfully. Wilbur gliding in level flight, Kitty Hawk, North Carolina. Wilbur and Orville’s father, Milton Wright, a bishop, had a remarkably progressive parenting style. The family environment he fostered was instrumental to the Wrights’ accomplishments. Milton built a modest private library in his Dayton home and permitted his children to skip school if their self-directed studies were sufficiently consuming. Thanks to this, Wilbur became fascinated with flight and devoured everything he could about flying. The Wrights knew they weren’t the only people in the late 19th century who were trying to solve the complex problem of getting off the ground, but they were certainly among the least well known. The brothers kept up on the latest news about Otto Lilienthal, a German glider enthusiast, and Pierre Mouillard, a French poet and farmer who also shared a serious interest in flight. Wilbur spent a lot of his free time watching the way birds soared. He observed that the air flowing over the curved surface of the bird’s wings created lift. Examining the way birds change the shape of their wings to turn and maneuver, Wilbur decided that he and Orville could use this same technique to control flight with mechanical wings. One night in 1899, Wilbur sat down and wrote a letter to the Smithsonian Institute requesting any periodicals or books they had regarding flight. He and his brother received a response and, armed with their new research, were soon conducting experiments with kites and gliders. As product designers, we often propose design solutions based solely on our own ideas. This can sometimes get us into trouble. Although we may start with our own assumptions and “best guesses,” in most cases the way to build a truly successful product is to go out into the world and observe how others have approached the same or similar challenges. By building on the thoughts, work, successes, and sometimes failures of others, we can push the most innovative solutions forward. Just as the Wright brothers studied the techniques that other people employed and the results they achieved, so must we. And just as they spent a significant amount of time observing birds in flight, so too must we spend time observing our users and look for ways to make their experiences better. 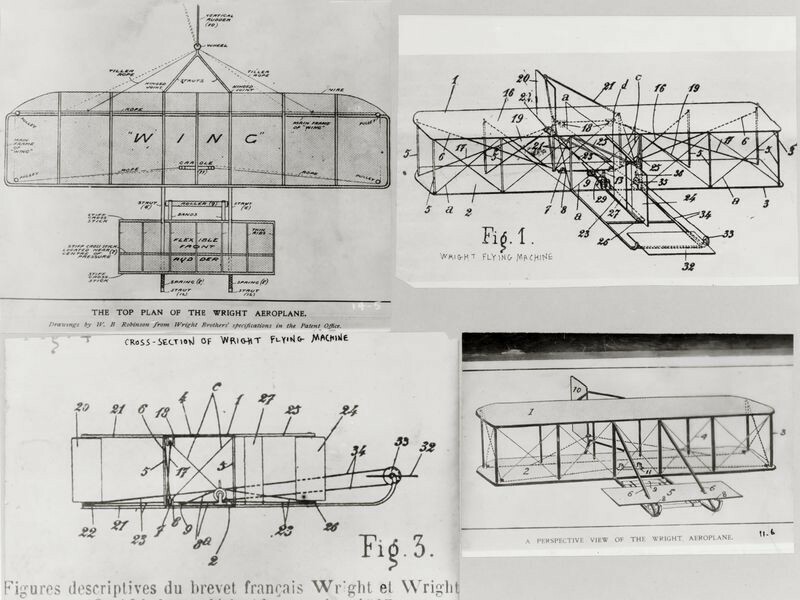 Patent Plans for the Wright Brothers’ Airplane. The Wrights were able to succeed as they did thanks in large part to their systematic approach to finding solutions to the problems they faced. McCullough cites one decision that exemplifies this approach. The brothers chose to undertake an arduous and expensive journey from Ohio to North Carolina’s Outer Banks to conduct their experiments. They arrived at that choice after doing extensive research to find a location that had a constant steady wind; soft, sandy surfaces; and no obstructions (such as trees) that might damage their delicate prototypes. They chose Kitty Hawk, North Carolina, with its seemingly endless supply of wind coming off the Atlantic Ocean, in order to test their gliding experiments before introducing an engine and attempting powered flight. The glider tests in the late summer of 1900 were amazingly successful, producing flights of up to 400 feet at 30 miles per hour. The next step in their deliberate, systematic approach was to build more models to test various curvatures, wing shapes, and propellers in their own custom wind tunnel — a 6-foot wooden box they developed to help them improve their designs. They perfected their glider and its mechanics and, with the help of a local machinist, designed and built a simple 12 horsepower gasoline engine for propulsion. As product designers, we need to continually prototype and stress test our designs before spending the time and considerable resources required for development. We need to remember that success does not occur overnight. We can learn from the Wrights that a patient, systematic approach leads to better, more efficient, more successful outcomes. Getting a product off the ground that doesn’t solve our users’ problems is an avoidable and costly failure. In the case of the Wrights, their lives often depended on success. Thankfully, for my team, the stakes for building business software are somewhat less extreme. But prototyping our designs and getting them in front of real users in real situations allows us to fail fast and learn even faster. By following the process the Wrights employed — prototyping patiently and deliberately — we gain insights into our possible errors and assumptions, have the opportunity to continually improve the design, and ultimately get to market faster with a more successful solution. Read Part 2 of this series for five more lessons from the Wright brothers that we can apply to our jobs as designers, including finding new ways to document our work, and making constant improvements to our designs. Thank you to Sue, Richard, Randall, Liz, Andrew, Paula, Genevieve, Anna, Zai, and others who reviewed drafts and gave helpful feedback.